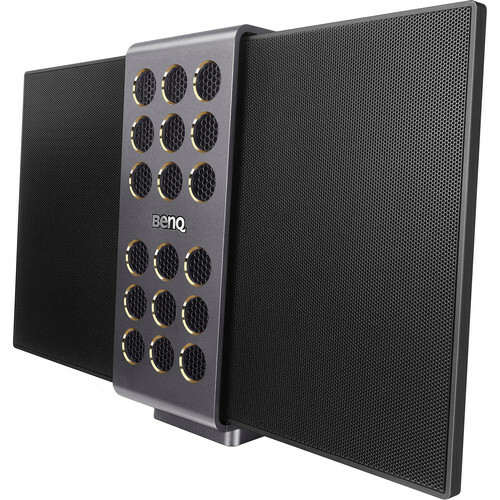 Take your portable audio to the next level with the black BenQ treVolo Electrostatic Bluetooth Portable Speaker. This speaker produces sound through a pair of electrostatic panels, each of which layer a thin sheet of graphite-coated conductive polyester film between two perforated metal grids. When current passes through the grids, it creates an electrostatic field that vibrates the film back and forth to produce sound. The anodized aluminum cabinet houses a pair of 2.5" subwoofers as well as passive radiators. The panels fold against the sides of the cabinet for portability and can be opened up for a wider soundstage. Two dual-channel class-D amplifiers drive the speakers, and the built-in three-channel DSP chip handles crossover filtering and equalization. An integrated noise-cancelling microphone lets you take calls on your treVolo. When you're done, your music will resume automatically. A rechargeable lithium-ion battery provides up to 12 hours of playback on a charge. Low mass allows the speaker to change frequency faster than conventional cone speakers. Electrostatic speakers are open on both faces of the speaker, instead of just one. This allows them to send sound backwards, where it can bounce off of walls and other surfaces and provide better coverage. Lack of sealed enclosures prevents enclosure resonance and other unwanted artifacts. Electrostatic drivers can cover a more broad range of sound, allowing for a crossover frequency deeper in the system's frequency range, away from the most sensitive areas of the human auditory system. Box Dimensions (LxWxH) 10.6 x 6.1 x 3.5"
Does it come with a remote control? If not, can a remote control be added? Please recommend an aftermarket remote. There is no included remote control and there are no compatible 3rd-party remote devices offered.